There are a few things that I consider guilty pleasures…One of them is watching a show we all love to hate… The Bachelor. Because c’mon, any television show that put 25 single gals in the same house with the hopes of meeting the one is fine by me. But how can you all immediately fall in love with the same dude??? They don’t even give you options; I mean even Baskin Robins has flavours to choose from. A second guilty pleasure of mine, also television related, (clearly I have to get out more) is the show The Vampire Diaries and True Blood, gorgeous guys going in for a little nibble… What’s not to love? But the main reason I love these two shows is because they come fully loaded with a hot dinner date. Twice a week my buddy and I swap houses and take turns cooking for one another, love traditions that involve food. I think her husband thinks that we just spend the entire evening staring at one another. But just so you know, we only do that for half the night. 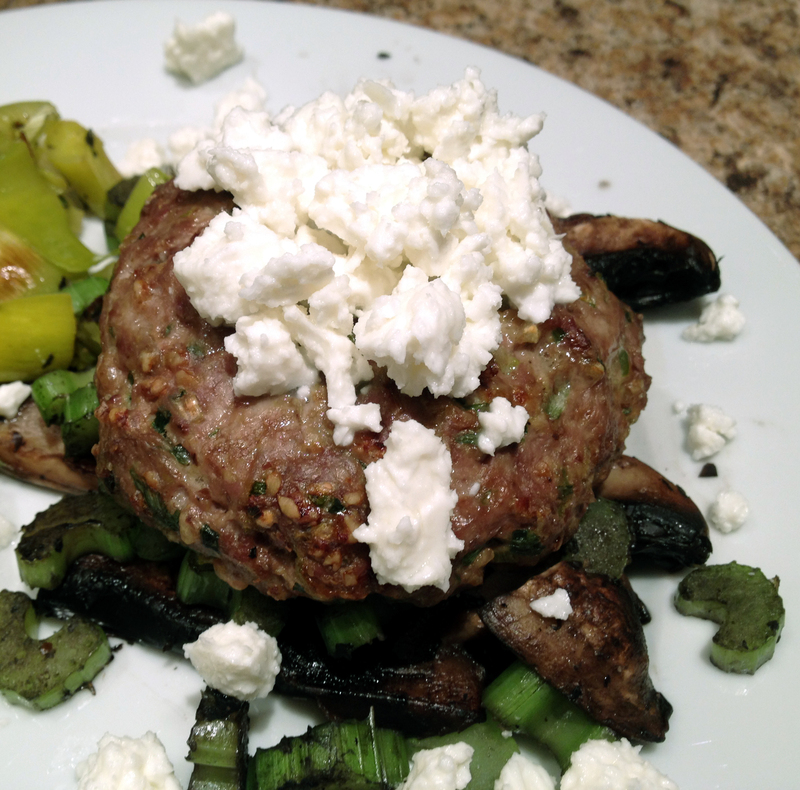 Portobello Mushrooms with a loaded turkey burger, stuffed with spring onion and walnuts, then topped with goat cheese and a side of roasted leeks and fresh thyme. Holy that’s a mouth full, but don’t worry it’s a delicious mouth full. And of course Feta goat cheese, this is a topper so you can either go nuts on the cheese or just sprinkle a little bit, I leave it to your good cheese judgement. Now for this recipe you can physically “stuff” the mushroom caps or do like I do and make a deconstructed version, in layman’s terms less work but still looks fancy. Clean and slice your mushrooms, I like to keep my slices pretty thick so you should get about 6 slices per cap. Throw them into a pan with the coconut oil and set aside. Next you’re going to clean and chop up your celery then set aside, the pan isn’t ready for them yet. Then in a food processor toss in your garlic, spring onions and walnuts and pulse until they’re combined, no big chunks, transfer into a bowl with your raw ground turkey, salt pepper and mush it all together with your hands. Yep that’s right your hands into a bowl of raw turkey meat, vegans look away. Now you’re going to form 4 turkey burgers, since it’s just me and Krista I freeze the other 2 for a future date night. These take about 25-30 minutes in the oven at 425 (parchment paper, baking sheet, you know the drill). I like to put mine under the broiler for an additional minute or two at the end just to get a nice char on the top of the burger. For timing purposes obviously you’re going to put your burgers in the oven before you cook up your mushrooms. The hardest part about being a chef is making sure all of the elements of your meal come together at the same time. But your burgers almost time perfectly with your leeks so let’s get them started too. 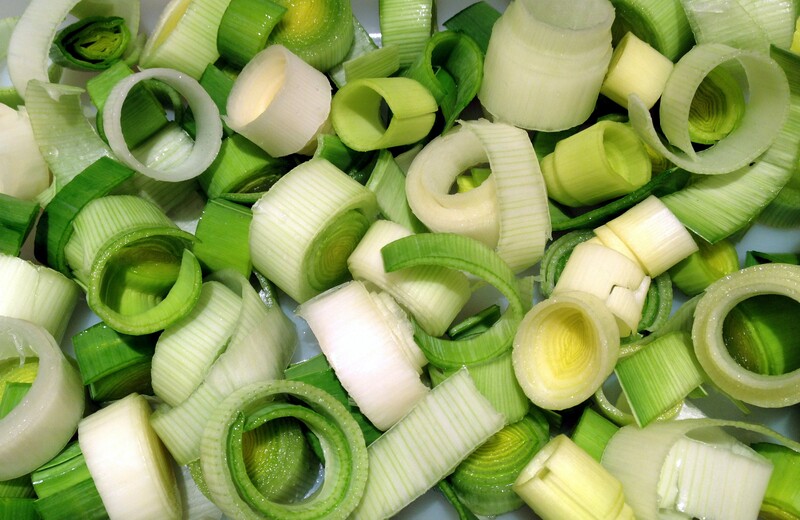 Chop up your leeks (about an inch thick) and toss them into a sink full of cold water. Leeks can be very sandy so make sure to clean them thoroughly. 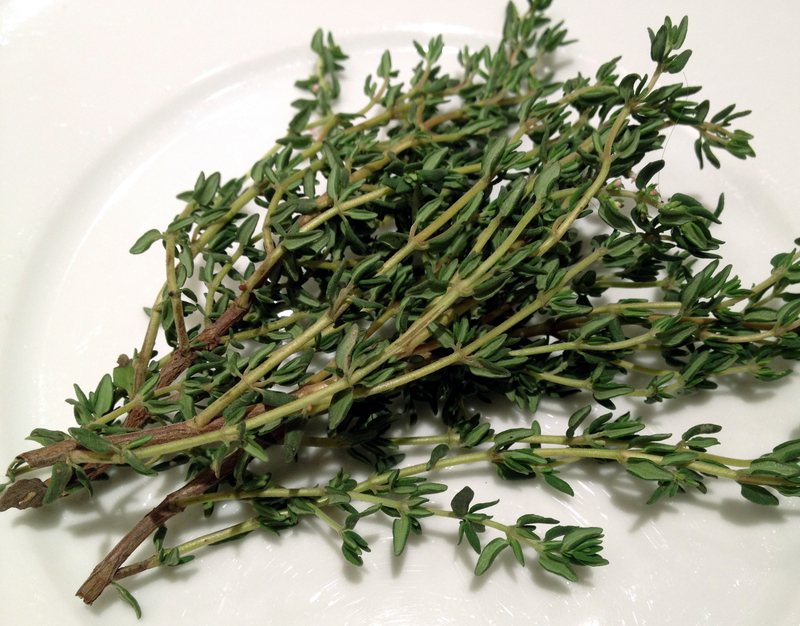 Once sand free toss them into a baking dish with your avocado oil, thyme and salt and pepper. These take about ten minutes longer in the oven then your turkey burgers, so about 35-40 minutes. 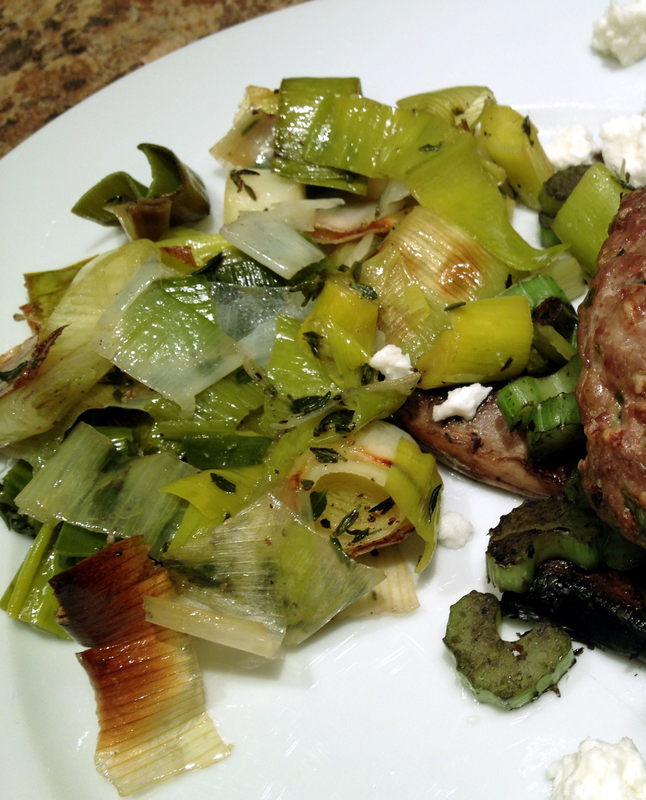 Throw the leeks in the oven and about ten minutes in add your turkey burgers. Then when you have about 10-12 minutes left on your burgers and leeks start-up your pan of mushrooms on medium high heat to get the butter melted and mushrooms cooking. 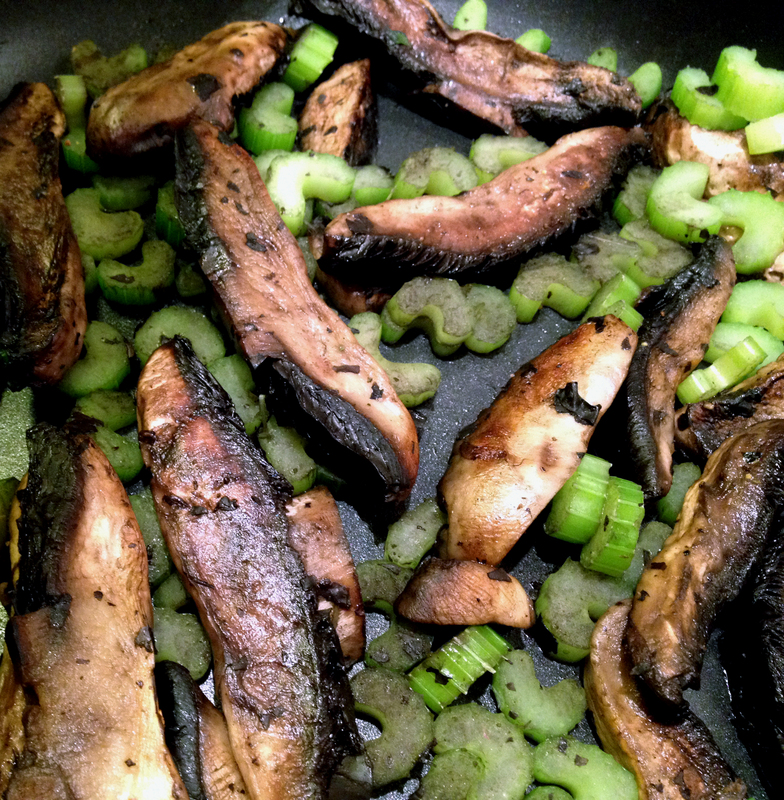 Once the pan is heated turn down to medium low heat, I like to add my celery in at the end only because I like the crunch, but if you would prefer it a bit more cooked down and soft throw the celery in at the beginning with the mushrooms. 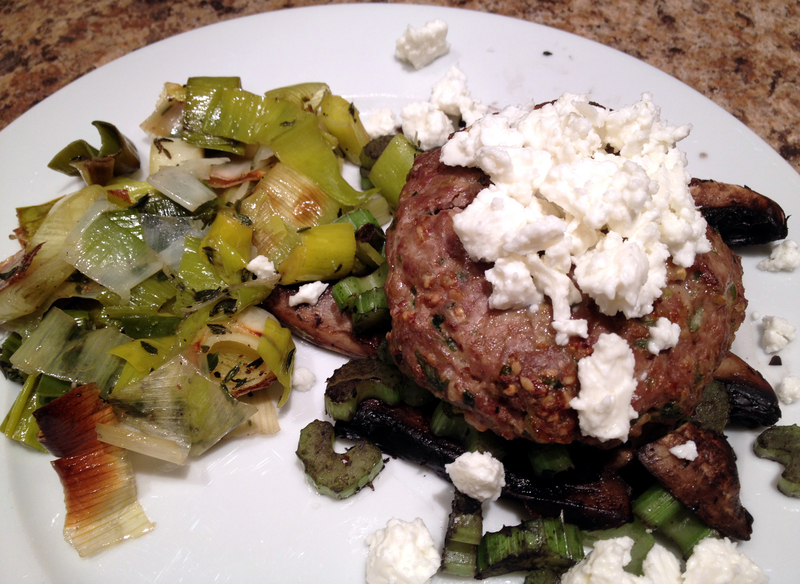 Once you’re ready to plate start with mushrooms and celery, top with your turkey burger and crumbled feta then your leeks on the side. Sorry Emeril, I felt the “BAM” was necessary.